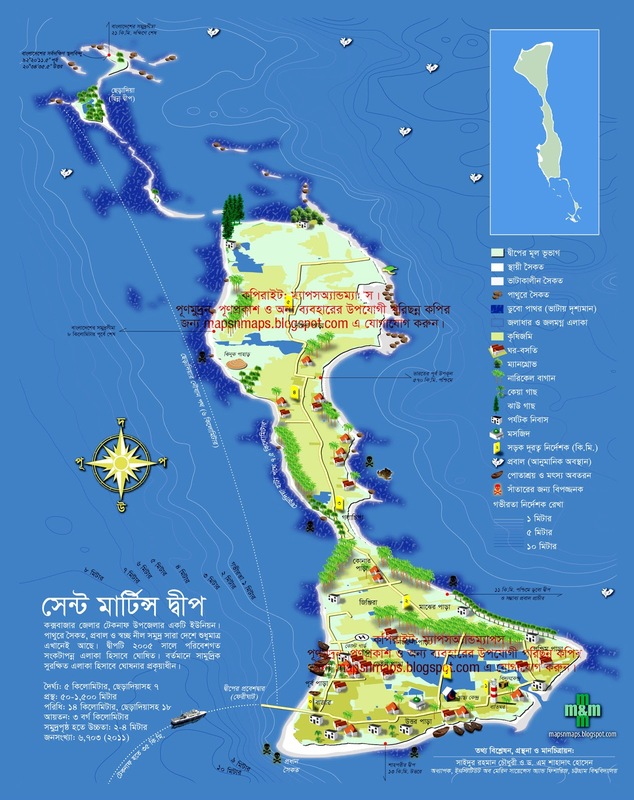 Guide map of the St. Martin's Island, Bangladesh is a copyright protected creation. EXPLICIT PERMISSION IS NEEDED FOR PUBLIC USE AND/OR REPRODUCTION. The icon color for "Shatarer jono bipotjonok" should be same in legend and actual points. Sure, thank you. I am going to update the map really soon. Thank you for bringing it to my notice. Sorry about whatever had happened. I am going to fix it soon. Please come back later. Study suggests that fewer people interpret a map correctly if it is North-Up, while majority readers find it more comfortable when the maps is Head-Up. This is why all Car GPSs come with head-up map display. I made this map head-up and there is nothing wrong that I should correct. Thank you. That is your assumption, which is not entirely correct, or perhaps not at all. A map can be oriented in whichever direction is suitable, as long as there is a compass or direction indicator present. Moreover, a compass or a 'grammatical north' indicator is not at all necessary on a tourist guide map. And then, even if this map is 'stationery' as you call it, the target users will not be, they will be moving. Most of the tourists approach the island from the North, and sees the south lying ahead. And it would be rude for you to think that we did not do our field work and tourists' survey before this map was finalized, this map is a by-product of exactly 30 years of my field work on this Island (1986-2016). I need the fresh copy of this map for my research purpose-immediately. If you will provide me a fresh copy of this map that can help me. Please write me an email (email link given above, on the right). Can I get the fresh copy of this map for my Practical Work? If you will provide me a fresh copy of this map that can help me. Thank you for your very big effort. May i know your contact no.I need a corrected version of this map. I prefer to get it in English. Can i get a fresh copy of the map.It will be used for academic purpose.